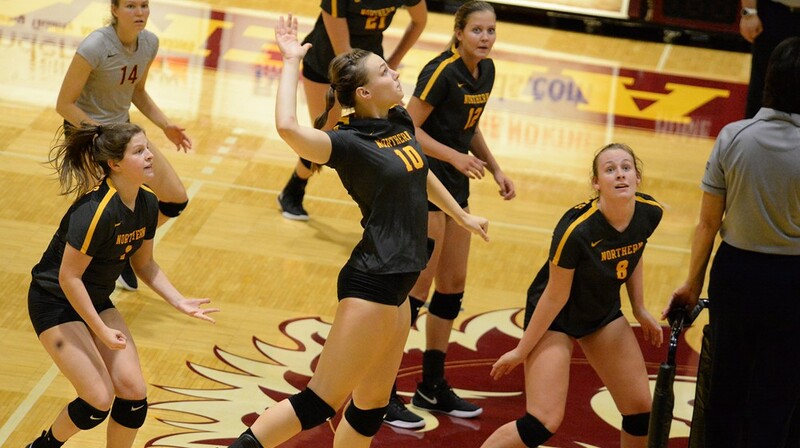 Northern State continued its steady rise in the AVCA Division II Poll, taking over the top spot with a 3-0 mark this past weekend. It is the program’s first ever top AVCA ranking. The Wolves, who downed MSU-Moorehead, Bemidji State and Minnesota-Crookston in straight sets, to remain undefeated (13-0) on the season received 41 of 47 first place votes and collected 1,168 points. Concordia-St. Paul jumped up one spot to 2nd nationally with a 3-0 week of its own. The Golden Bears, who have won each of the last 2 national championships and 9 all-time, defeated Minnesota State (3-0), 18th-ranked Wayne State (3-0) and Augustana-SD (3-2). CSP, which received 6 first place votes and 1,107 points this week, is riding an 8-match win streak. Palm Beach Atlantic (1,066 points), Lewis (991) and Cal State San Bernardino (978) round out the Top 5 of the poll. Washburn joined the poll at 21st after receiving votes last week. The Ichabods went 2-0 with a 3-set win against Fort Hays State and a 4-set upset victory over then-ranked 1st Nebraska-Kearney. On the season, Washburn is 14-0. Findlay, which was 24th in week 3, was the lone team to drop out of the standings. The Oilers went 2-1 on the weekend. 10 teams mentioned in only one ballot for a total of 79 combined points.